The first book in an addictive, romantic trilogy from New York Times bestselling author Sophie Jordan is perfect for fans of Laini Taylor, Tahereh Mafi, and Claudia Gray. With her rare ability to breathe fire, Jacinda is special even among the draki—the descendants of dragons who can shift between human and dragon forms. But when Jacinda’s rebelliousness forces her family to flee into the human world, she struggles to adapt, even as her draki spirit fades. The one thing that revives it is the gorgeous, elusive Will, whose family hunts her kind. Jacinda can’t resist getting closer to him, even though she knows she’s risking not only her life but the draki’s most closely guarded secret. Mythical powers and breathtaking romance ignite in this story of a girl who defies all expectations and whose love crosses an ancient divide, from New York Times bestselling author Sophie Jordan. 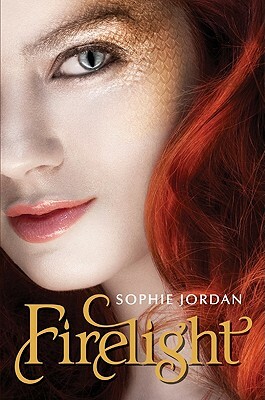 Sophie Jordan grew up on a pecan farm in the Texas hill country, where she wove fantasies of dragons, warriors, and princesses. A former high school English teacher, she's also the New York Times bestselling author of Avon historical romances and the Firelight series. She now lives in Houston with her family. When she's not writing, she spends her time overloading on caffeine (lattes and Diet cherry Coke preferred), talking plotlines with anyone who will listen (including her kids), and cramming her DVR with true-crime and reality-TV shows.